April 13, 2015 | Posted by Lee C.
There are so many exciting plans and preparations when welcoming a new baby into a home. One of the most fun projects can be decorating a nursery. With so many options available it can also be overwhelming. 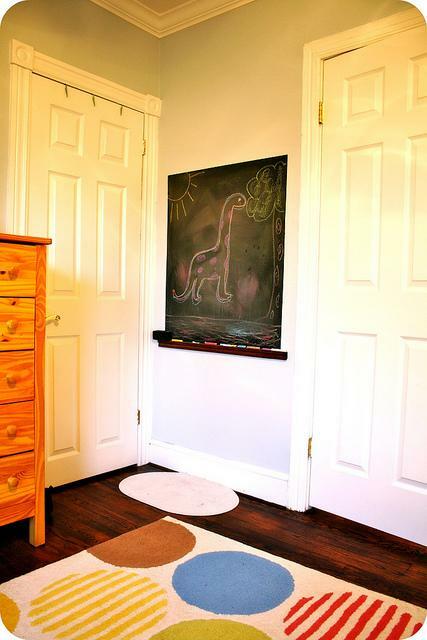 Here are a few tips and ideas to create a fun nursery you and your baby will love. As you start out, you should choose a style you enjoy and that is comfortable for you. Your baby probably won’t have an opinion about the decor for a few more years. Choose colors and patterns that you like. Many colors beyond the traditional pastel pinks and blues are popular right now. Try combinations like grey and orange, neutral browns and greens, and bright orange and turquoise. Plan several options for lighting. There will be times you want the nursery to be bright and to encourage play. 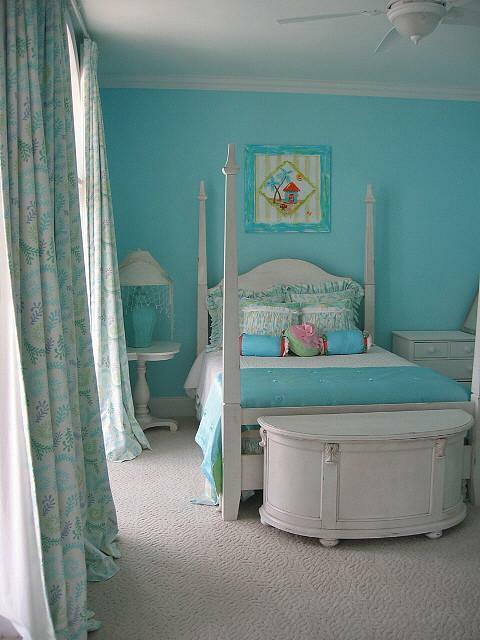 Other times you will want the nursery dim and quiet. Be sure to find soft lamps to accompany any overhead lighting. Babies love to look at pictures; faces, bold shapes and patterns in contrasting colors are particularly stimulating. You can easily cut pictures out of old story books, use patterned scrapbook paper, or blow up pictures of family and frame them to hang on the nursery wall. Bulletin boards are also fun to hang up pictures of friends, family, special places, and cards. Wall decals are particularly popular right now. They are an easy way to add a personal touch to a wall. They are also removable once your child becomes old enough to want something different. Mobiles are also an attractive addition that can stimulate your baby in the crib or on the changing table. There are all kinds of do it yourself mobile ideas available, like using colorful pictures from magazines cut into shapes and strung on fishing line or colorful ribbon. BabyMobile.com offers some mobile safety tips to keep in mind as you craft your mobile. 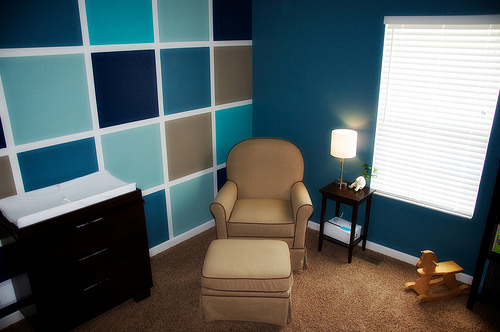 Ultimately, your baby’s nursery should be just right for you and your family. Make sure you have everything you need easily accessible, from diapers to bedtime stories. Invest in comfortable and safe furniture and decorations. Sleepless nights might be more bearable when you are cuddling your baby in a room you love. What Bedding Should You Have on Hand? How much bedding you should keep in your linen closet can be a very subjective debate. A lot will depend on how many and what kind of beds you have, how often you like to change your sheets, as well as how drastic your seasonal weather changes are. The general rule is that sheets should be changed about once a week. It is important to wash your sheets in warm water regularly to get rid of any bacteria or dust mites. You may want to do this more often if you suffer from allergies. If you want to be able to make your bed again quickly, before your sheets have made it all the way through the wash, you may want to have at least two sets of sheets per bed. That way you can make the bed with a new set and fold up the clean ones for the following week. You may want to change your pillowcases more often especially if you are allergic to dust-mites, so having a few extra oh hand for a quick replacement is very helpful. 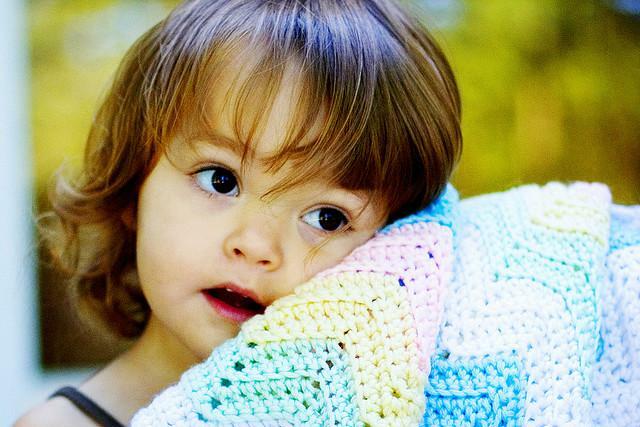 Children’s beds and crib sheets may require more frequent washing. If you want to wait to do a full load of laundry before you wash them you may want to have three or four sets on hand. Don’t forget about your guests. If you have an air mattress, sofa bed, or guest bed you want to have the appropriate bedding on hand for them. You don’t have to have a comforter if you don’t want to but a few extra blankets are nice. Guest beds generally require only one set of sheets because you are not likely to change them during their stay. Next, you should consider changing your bedding material according to the season. Think about having a cool, light weight sheet set for the summer, and warm, cozy flannel sheets for the winter. An extra blanket might also be important to add to your bed for the winter months. If you live in an extremely cold climate, consider investing in an electric blanket or heated mattress pad. Most likely, you will want to have between three and four sets of sheets per bed; two summer sets of sheets and two winter sets. 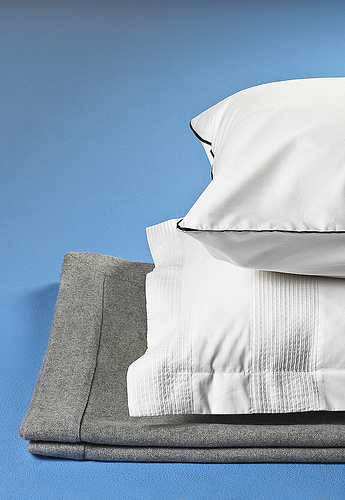 Buying quality sheet sets will help your sheets last longer and be more comfortable. 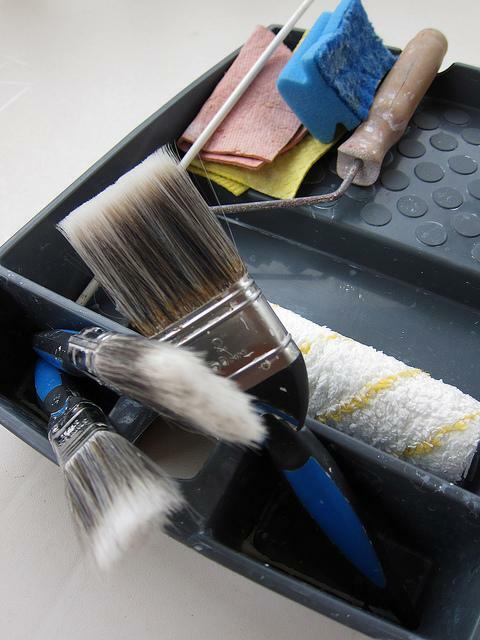 If you like to change your decor regularly, choose neutral colors like white or off white which will go with anything. Determine exactly what you want to have on hand and what will make your life easiest then invest in the right bedding for each season. Make sure you are getting the quality you expect. Short sheeting is a prank that siblings and college roommates play on one another. The sheets are tucked into the bed so that the person going to sleep can’t get in the bed. While short sheeting in dorm rooms is a funny prank, being short-sheeted in the marketplace is not fun. If you are not careful, you can be short sheeted, by getting a lower quality product than you expected, when buying sheets. It can be hard to find good, quality sheets at a low price. Don’t be fooled by labeling. Crafty wording can make you feel like you are getting a great deal on a quality product. Be sure to look at all of the fine print before you make a purchase. Often sellers will use catch phrases such “Egyptian quality” in their descriptors or labels. This makes the buyer assume the sheets are made of Egyptian cotton, when really the sheets are not cotton at all. They may be made of polyester or some other fiber. Sellers can also inflate the thread count. Thread counts much higher than 500 do not necessarily mean better quality. Claims of 1000 or more can make the buyer assume they are getting a durable, ultra soft sheet. 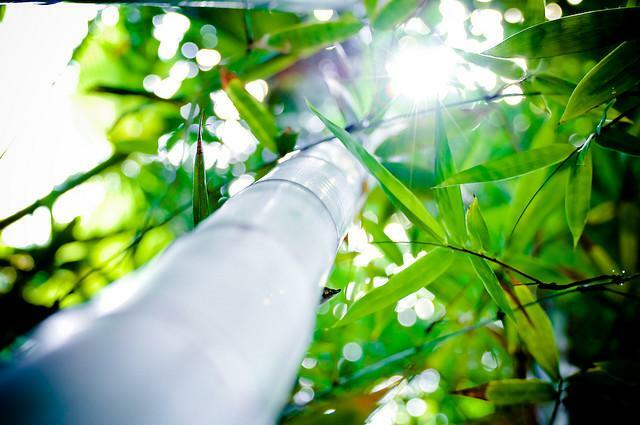 However, these claims can be based on how the fibers were counted, rather than a significantly higher number of fibers in the sheet. To avoid bringing home a set of sheets that is not what you expected, be sure to read all of the labels. Look at the materials so you know what the sheets are made of. Look at the care instructions as well. You don’t want to be surprised with dry clean only if you are expecting to be able to wash them at home. When you are buying online, you may want to look at reviews of the brand before purchasing. You should also find out what the return policy is in case you are unsatisfied with your purchase. A low price is not always the best deal. While there can be reasonable prices on sheets, cheap prices often indicate inferior quality. Buying American made, organic, or custom sizes may cost a bit more, but you will have peace of mind knowing you are getting exactly what you want. Be wary of phrases that don’t convey accurate information about the sheets. Read all of the fine print such as materials and care instructions. Avoid the impulse buy and do your research to get the product you want. What do you look for when buying sheets? Have you ever been misled by what you thought was a great deal? Give your special quilts extra care. 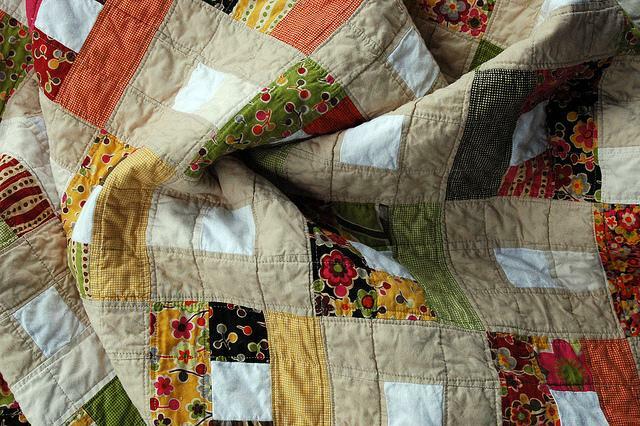 Handmade quilts are a meaningful part of many home linen collections. They come from your own hard work, grandparents, friends, craft fairs, or are handed down through the generations. They are often given for special and significant events, such as the birth of a baby or as a wedding gift. It may be tempting never to use these treasures for fear of ruining them, however, quilts are made to be enjoyed. At some point you will probably need to wash your quilt. Even if it is hung on the wall for display, eventually it will gather dust. Here are some tips for cleaning your special quilt without damaging it or causing too much wear. About.com Laundry Tips suggests checking your quilt for color fastness before you wash it. Take a white rag and wet it with cold water. Rub the rag over all of the different colors on the quilt. If any of the colors are picked up by the white rag, the quilt is not colorfast. You will want to avoid washing it because the colors will run or fade. Instead you can spot clean the quilt with water and mild detergent. The best way to wash your quilt is by hand in the bathtub. Fill the tub with water and use a very mild, fragrance and dye free detergent. Work the quilt through the water for a few minutes. Then drain the tub and refill it to rinse. You may have to repeat the rinse process several times until the water runs clear. To dry your quilt, lay it flat in a large space. You can use towels to soak up some of the excess water. If you lay your quilt outside to dry, keep it out of direct sunlight and cover it with an old sheet to keep the colors from bleaching in the light. Do not hang your quilt to dry because this will put a lot of pressure on the seams and could cause damage to the stitching. Quilting 101 recommends washing a quilt in the delicate cycle of a machine, preferably one without an agitator. Again you should use fragrance and dye free detergent and avoid softeners. You can add a half cup of vinegar to the wash to soften the fabric. After the cycle is done, run it again with no detergent to ensure that the quilt is thoroughly free of any detergent. Quilting 101 also states that you can dry a quality made quilt in a machine on low, just like you would any other cotton clothing. As with any piece of fabric, the less often you wash it the longer it will last. Wash your quilt as little as possible and handle it with extra care and it will last for generations to come. How do you care for your special linens? Sofa beds, also called pull-out-couches, are a great way to accommodate guests when bedroom space is limited. They allow you to welcome guests into your home when your living space is limited and does not include a guest room. Even though sofa beds may not have the same comfort level as a conventional bed, there are ways to enhance the comfort of a sofa bed. Depending on the style and quality of the mattress, you may need to add a mattress topper for added padding. This is especially important if the sofa bed frame contains a support bar under the middle section of the mattress. 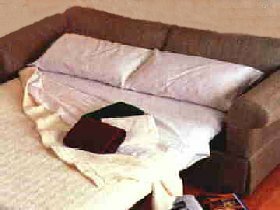 Since sofa bed mattresses are typically four to five inches thick, the bar can sometimes be felt through the mattress. Often, regularly sized sheet sets will not fit a sofa bed. 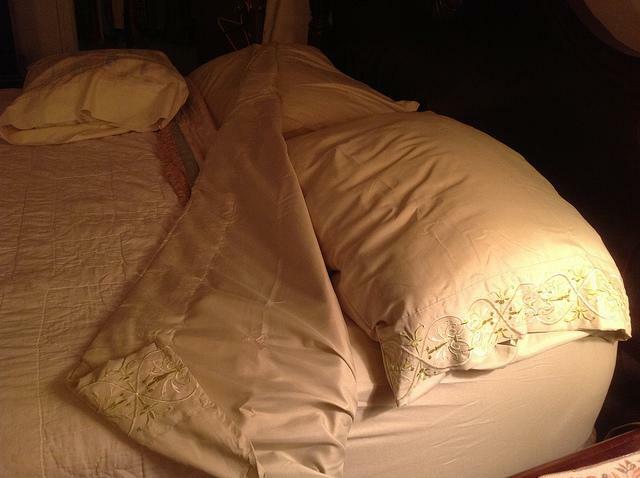 They are either slightly too large, causing uncomfortable wrinkles in the bed or too small causing the corners of the fitted sheets to come off while your guest sleeps. Ordering appropriately sized sheets will create the perfect space for you guests to enjoy a relaxing night of sleep. Cozytown Linens offers sheet sets designed specifically for sofa beds. They are available in either 8 inch or 6 inch pocket depth, so be sure to measure your sofa bed before you order. The flat sheets included in these sheet sets also have a fitted bottom so that they stay in place while your guest sleeps. In addition to sheets, a mattress pad will provide extra comfort for your guests and protect your sofa bed mattress so it can have a longer life. The metal frames of sofa beds can often be felt through the thinner mattresses of the sofa bed. This leaves a guest feeling an uncomfortable metal bar across their back during the night. To prevent pain and an uneasy night of sleep you can add a foam mattress topper to the sofa bed. Cozytown Linens sells a foam mattress pad that provides extra cushioning to prevent discomfort. The thick foam pad has a quilted surface to provide a soft place to rest. It is attached with thick anchor straps at each corner to prevent the mattress pad from slipping. Help your guests feel welcome and get a good night’s rest by providing an inviting, cozy sofa bed. They may not have their own bedroom, but you can help them feel comfortable with luxurious, stay-put sheets, a soft mattress pad and a warm comforter. Going out of your way to make up a nice bed for your guests will help them feel at home. What other ways do you help guests feel welcome in your home?